Not far from where I now live, is the Nectar Community centre. It offers affordable studio spaces for artists, room for teachers to teach their creative classes in, and a gallery slash partyroom slash eventspace slash recital salon for anyone who wants to make a presentation, teach a dancing class, make music, throw a party, or show their work. It is unsure how long this place will exist. It has been bought, so far with a proviso, and is slated to become two living apartments. People from the neighbourhood have filed an official objection against these plans however, so for the duration of the time it will take to process that complaint and judge on it, it will remain there. And that will also be how long I will have a studio there. A studio with only one window, and a tad smaller then what I am used to - I am starting to see how the northwestern European situation for artists is a heaven compared to what I meet here in Ottawa- but a good space with a good atmosphere. No contract, no long term hopes, but at least I will have a space to work in again for the near future. I am so, so, so, so happy the drairy waiting time is over! I will be moving all my paint, my linen the ink and the markers and the crumpled paper and mangled old books and cut out pictures in next week and you will see updates with new work popping up on Instagram again not too long after that! Life in Ottawa has now officially been declared started! My wife’s work takes us over the world. As an artist, there are big upsides as well as downsides to it. The upside is the adventure, the opportunity to get an intimate, and extended look at another country, another culture, another identity and other stories. It is a great source of inspiration. The downside is the breaking up of networks every time we move. Since the artworld is made out of networks, this is a significant downside. 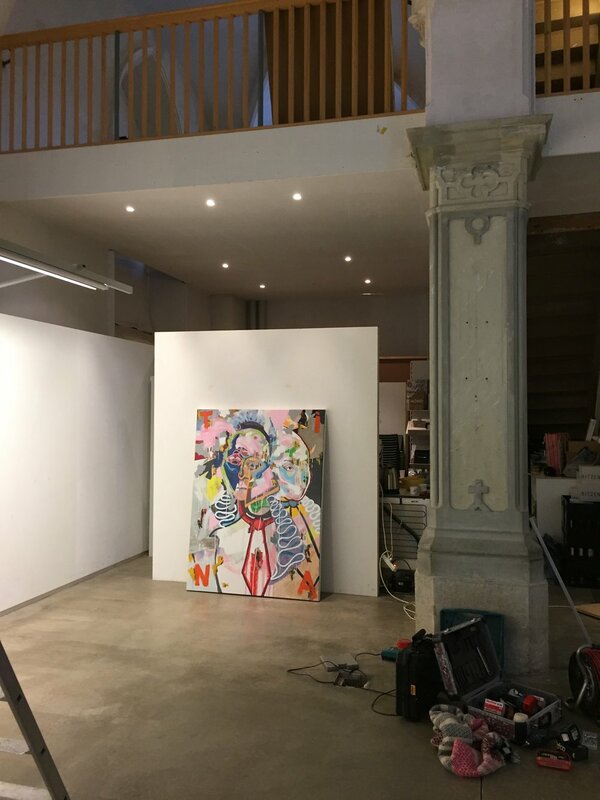 I have to find out where the art world is in every new place, find out where the established art world is, where the underground, up-and-coming, alternative art world resides, and find myself a working space that is affordable. An effort that takes time and resilience. In Ottawa, there is the Enriched Bread Artists, an artists’ collective housed in an old bread factory. I applied for a studio there and to my delight, was accepted to their waiting list. Unfortunately, there are still people on the waiting list before me and it is unclear how long it will take for a studio in the building to become free. Also, the EBA building is facing the danger that many artist’s collectives and studiospaces have already faced, fought and lost: Urban development. It has announced not too long ago that a development project is in the works for the area that the Enriched Bread Artists are in. Talks are now ongoing on how to maintain or otherwise incorporate the creative spaces in the new plans. So for me, the search for a studio is still on. Until that time, only my sketchbook is my workspace, the snow, wind, river and forests that permeate Ottawa my new world. And to think that Europe is full in the throes of spring already! A happy and healthy new year to all my friends, colleagues and art enthousiasts! Einen guten Rutsch wünsche ich meine Freunde, Kollegen und Kunstliebenden! Une tres bonne année pour mes amis, collègues et amoureux d'art! Een heel gelukkig nieuwjaar voor al mijn vrienden, kollega's en kunstliefhebbers! Remember: the Kantonale Berne Jura is still on till the 20th of january, and my work can be viewed in the old church of le Noirmont, every thursday through to sunday, 14:00 till 18:00. On top of that, a Bach recital wil be played in the church on sunday the 13th at 17:00. A hint for those who would like to combine music with art! 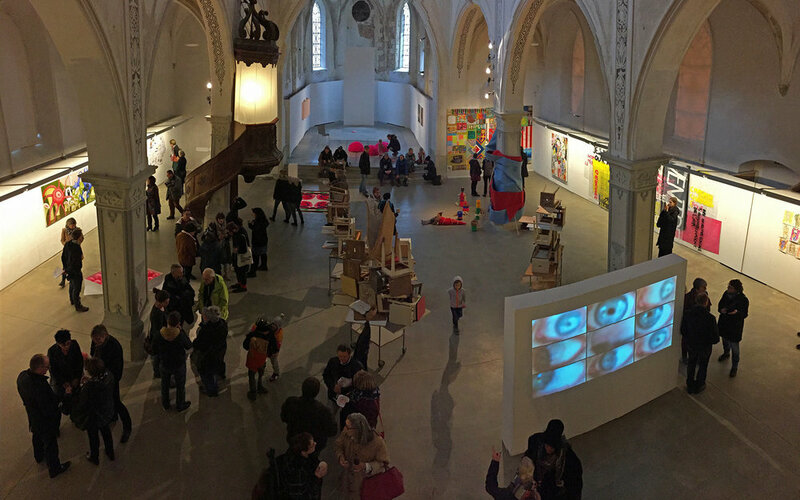 The vernissage of the Cantonale Berne-Jura 2018 was today, in the old church of le Noirmont, that is the exhibition space of contemporary art organisation La Nef. It is a beautiful space. There were plenty people, a little over a hundred during the whole vernissage, it was whispered. The atmosphere was what Dutch would call “gezellig” a mix of art lovers of all ages and their kids running through it all as the rain lashed the windows of the old church. The vernissage took about two hours, after which the wine was gone and therefore the people also headed back home through the storm. It looks like the Jura will see some snow tonight! Last weekend I delivered my work to the old Church that La Nef uses as it’s exhibition space. And what a space it is! Opening is next weekend on sunday, 9th of december, from 11:00 hours onwards! On Sunday the 9th of December, from 11 hours onward, the old church in Le Noirmont, run by cultural organisation “La Nef” will have the opening of this years Cantonale. Of course I will be there! After a long holiday I came home to the letter of the “Cantonale” announcing that one of my works has been selected to be shown in this years’ Cantonale Exhibition. Born out of the traditional end of year exhibit, the Cantonale has grown into an organisation of nine exhibition spaces and organisations within the two cantons -say, provinces, but Swiss style- of Bern and Jura that strives to present a yearly overview of the modern art scene of these cantons. Artists that live and work in these cantons are invited to submit their work, and from these submissions, works are chosen by the exhibition centres themselves. Turns out, the beautiful old church “La Nef” in Le Noirmont, Jura, has chosen to exhibit my work! The exhibition will run from the 9th of december till the 20th of january. 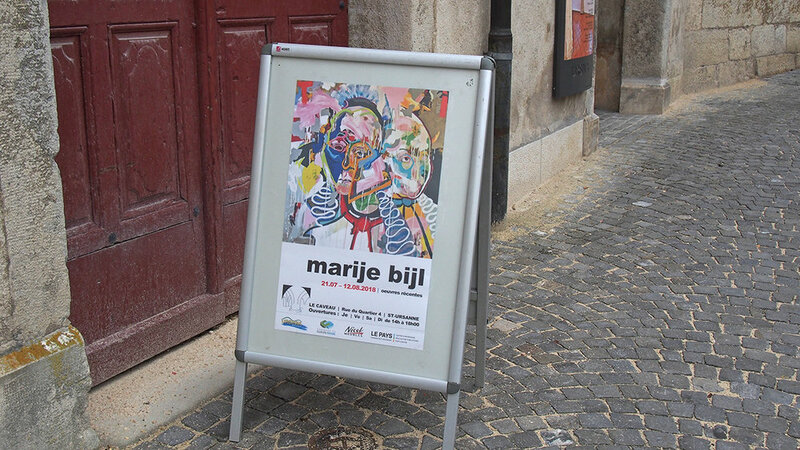 The vernissage will be on sunday the 9th, and of course I will be there! I have a feeling my work will do well on the walls of that old church. The show is over now and the works are coming back to Switserland, hopefully in time for my solo show in Saint Ursanne! But they are on their way now, in three layers of bubble wrap and snugly sandwiched in between styrofoam. The opening will be the 14th of June in the Onishi Project gallery! February in Milan, june in New York. I hope to be there as well, so if any of you just happens to pass by Milan, there will be Italian wine a-waiting. This one will surely be there. 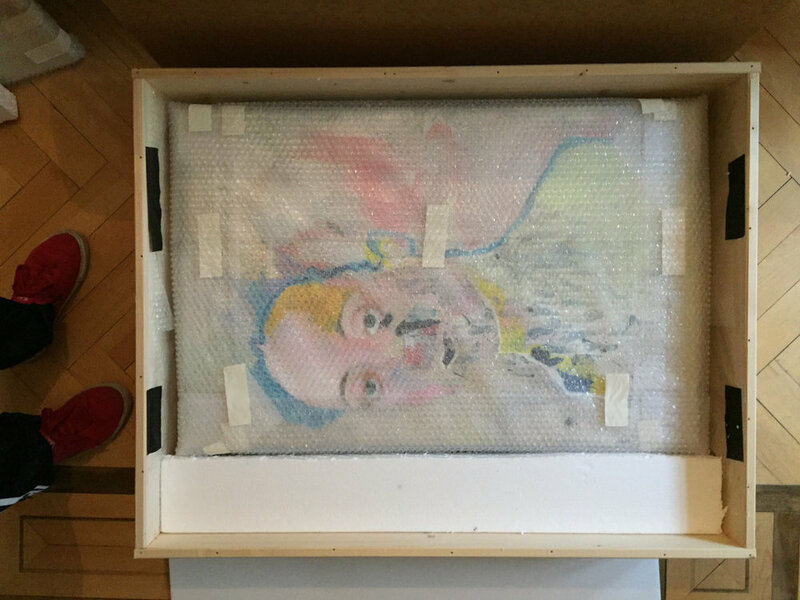 And then to make it all sweeter, three paintings of mine, two Catharina's and one Machiavelli, will travel to New York to show themselves in the Onishi Project gallery in Chelsea, at the Summer Group show II that will run from the 14th of June till the 27th of June. I like June. June is a good month. Pass on the word! Six drawings of mine -some of them, like the ones posted above and below, not yet uploaded on this website- were chosen to adorn a new project in China, that is currently being built. Yay! Final decisions will be taken somewhere in july or august this year, until that time it is still unsure wether all six will be taken or wether the designers will change their mind on which ones they will choose for which rooms. 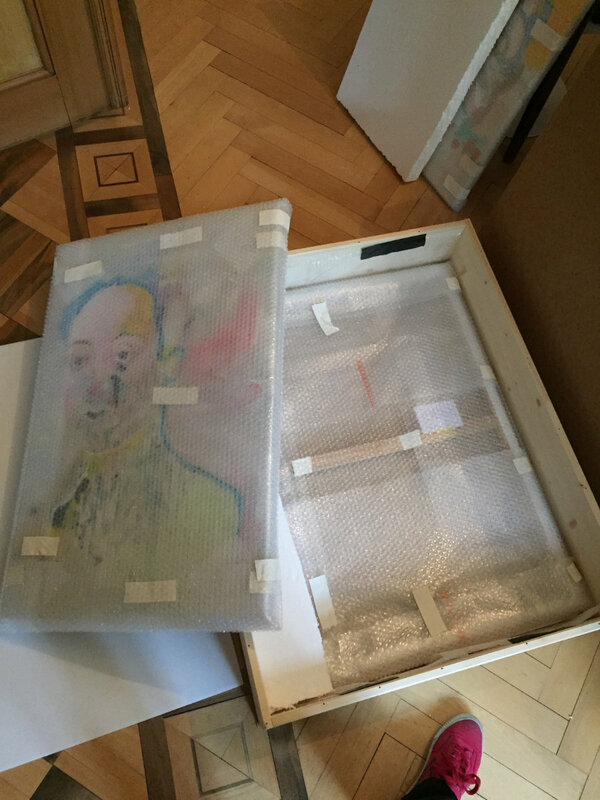 But one thing is already sure: some of my drawings will move back to China! I have a surfboard, that, in this landlocked country, I do not use. One day, not being able to progress on my artwork, I thought: f* it, I am going to try to make a drawing on that board. Just a drawing. Something one would expect, on a surfboard or snowboard. A cool illustration. No politics, no philosophy, no symbolism, no meaning, no juxtapositions, no fitting into the art history of the whole wide world... just a drawing. Here are the first try outs on paper, before I transfer them to the surfboard. To see how these posca pens work that I will need to draw on the material of the board, what colours they have and what kind of tips. To just draw without thinking about meaning, composition or continuity. It is actually quite relaxing. Thoughts and words on my work, and because of my work. ...not by me. By the editor of a The Hague artblog. I have lived in that city for 11 years. It is one of those cities that you think you will never like, and then as time progresses, you come to love. And you'll never be able to really define in words, why. Other cities are bigger, cooler, more modern or more old or more photogenetic, but.... this something. Beijing has that too. An unlovable city unless you keep at it, and then suddenly, she wont let go of you. But enough about cities. This here is about art, published on Villarepubblica on the 11th of april. All in Dutch, and it is a long story, an ode to thinking and smoke and Hannah Arendt, to whom the drawing the author is talking about, and looking at, is dedicated. So here is to thinking. With and without smoke and mirrors. Hannah Arendt smokes another one, XIII. Despite the name of the site, they are not related to "the Saatchi" in London. Or so they say. They are one of the biggest online art shops out there though, and offer all in service for payment, administration of that payment (which, let's admit, between different countries and tax systems can be a huge pain - in multiple ways) and shipping of the art overseas. So I got onboard. My work can be found on saatchiart.com here. Prices on the saatchiart.com site include the 20% commission they charge (most galleries charge 50% Which, by the way, I do not object to, but that is another story, for another blogpost) plus packaging and shipping. The amount of money that I get from it is the same as what I would charge right here in the studio. For the extra cost, they take over a lot of hassle from both you and me. So if you are overseas, and enamoured with my work, the saatchiart site might be a good option for buying my work. If you are within the EU however, I think we can then handle it ourselves. Then please shoot me an email through the form available on the 'contact' page. Or pass by in the studio!